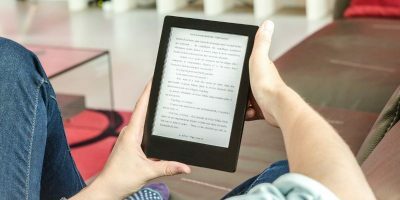 I bought an Amazon Kindle some time back and posted an article about some of the basic tips and tricks all Kindle users should know about. Having used the Kindle for a while it is clear that while it’s book reading functions take precedence, its creators decided to imbue it with a number of features that tip it into the realm of a “tablet PC”. While it clearly does not have the functionality of an iPad, the Kindle has a set of unique features that makes reading books just a little bit more enjoyable. In this article I will provide an overview of some of the more interesting features the Kindle has to offer. The Kindle was created with one function in mind: to read books. This means that doing anything, aside from reading books, is quite a chore. Nevertheless the Kindle does come with a handy web browser that can be used in a pinch. 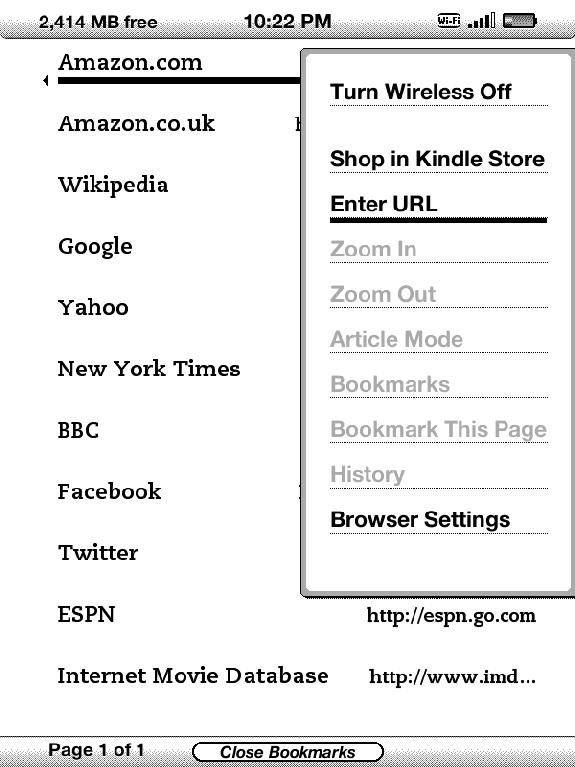 To launch the web browser press the Menu button on your Kindle. 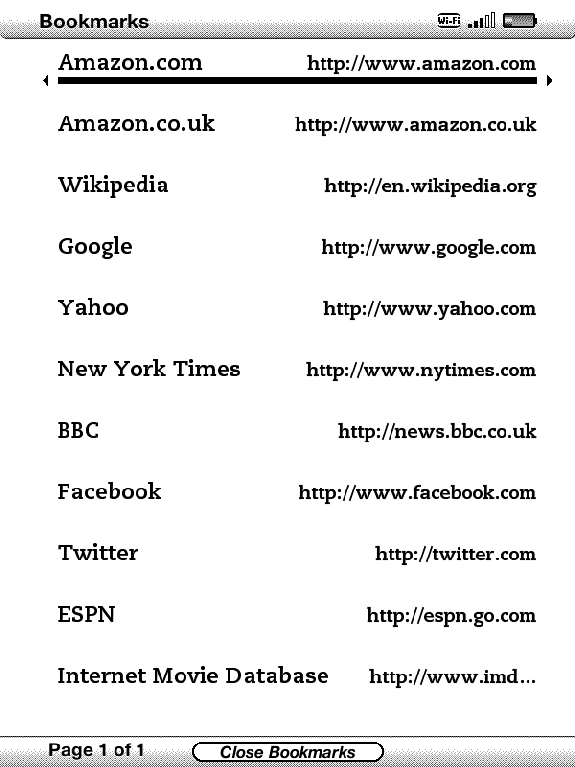 Once the browser launches you will be presented with a number of pre-bookmarked web sites. Selecting one of these launches the site immediately, or you can select Menu and Enter URL to browse to a web site not on the list. As I have mentioned in my previous article, the Kindle uses a special display technology called E-Ink. This is great for reading as you are generally looking at a static page. However, for something with dynamic content, such as a web site, it makes navigations and usability difficult. Further, since the display is not touch-screen moving the cursor requires you to use the D-Pad. Nevertheless, as you can see the page itself looks relatively clear and there is no content that is hidden or blocked. 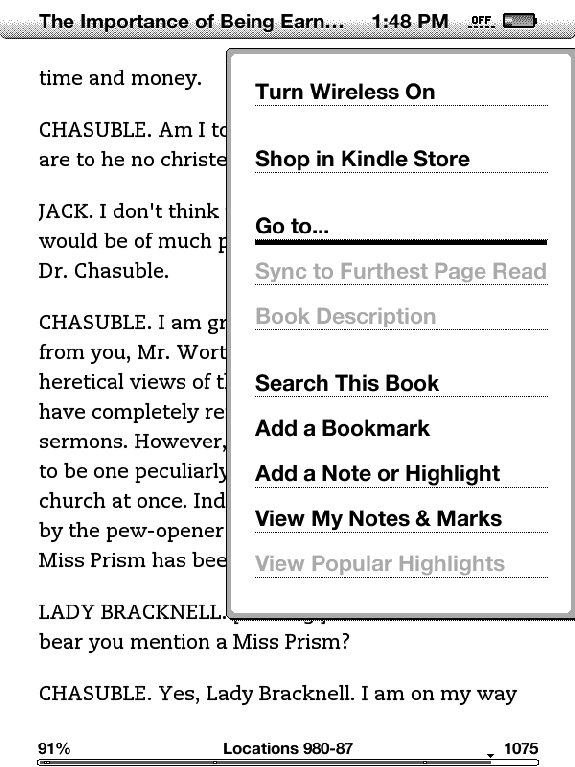 There is one other useful trick that the Kindle’s browser has. If you browse to a website with a lot of articles (such as nytimes.com) you can use the “Article Mode” to read the article without any of the other distractions on the web site. First, browse to the web site of your choice. Then use the Enter key to zoom into the section of the page which has the article you want to read. 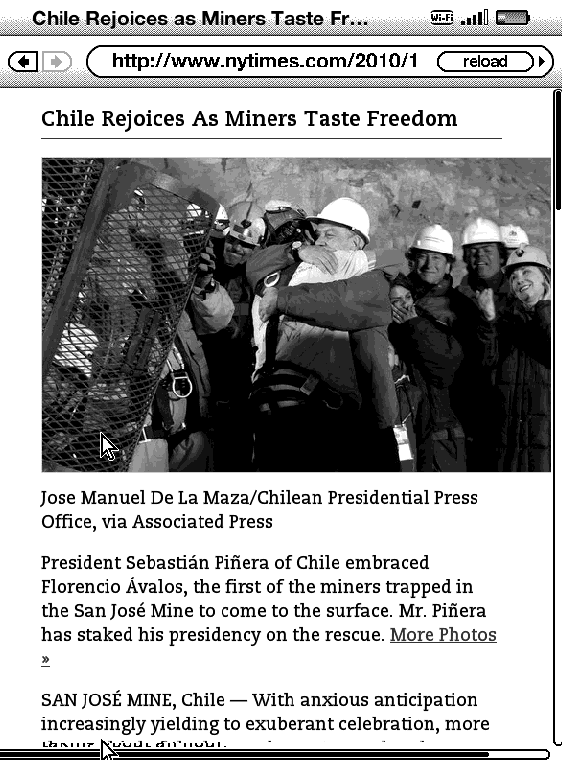 Once you have zoomed in select the article. 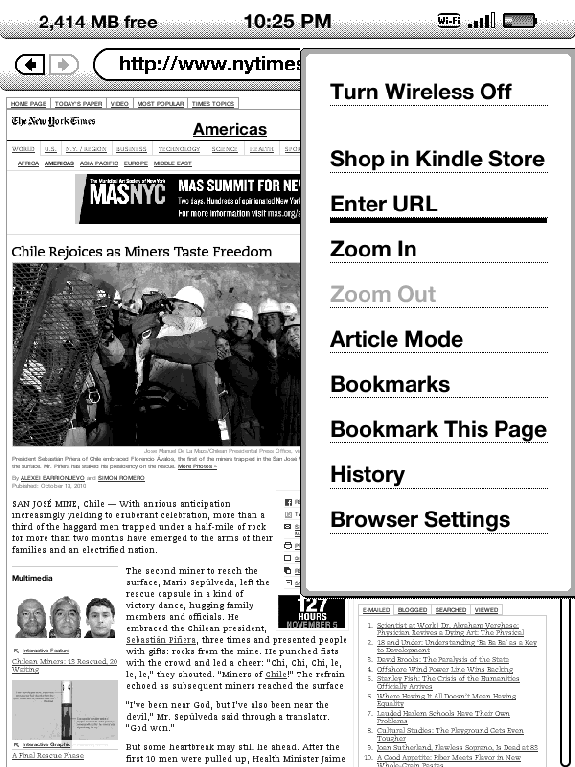 Once the article has opened select Menu and select Article Mode. This will reformat the article into a book format, allowing you to read through it as though it were another book on the Kindle. One of the most lauded features of the newer generation of Kindle’s is the ability to share what you are reading with the world. 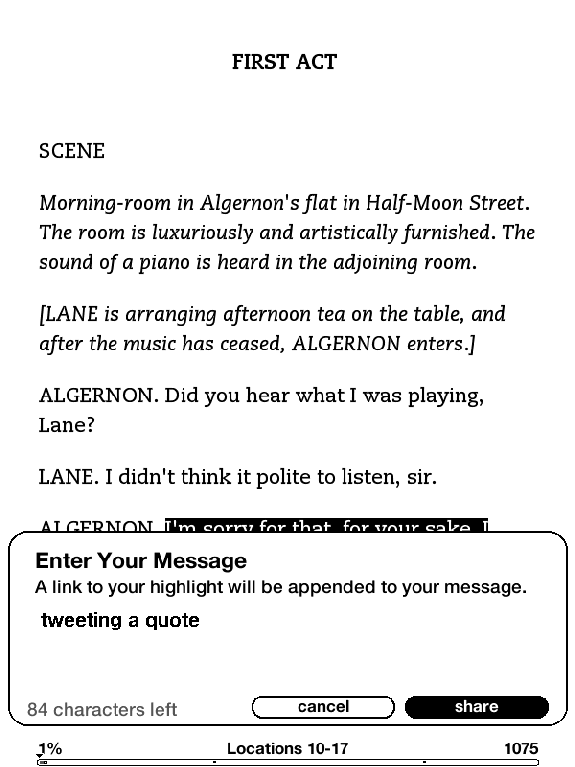 You are able to select a sentence or a passage of what you are reading and share it over Facebook or Twitter. 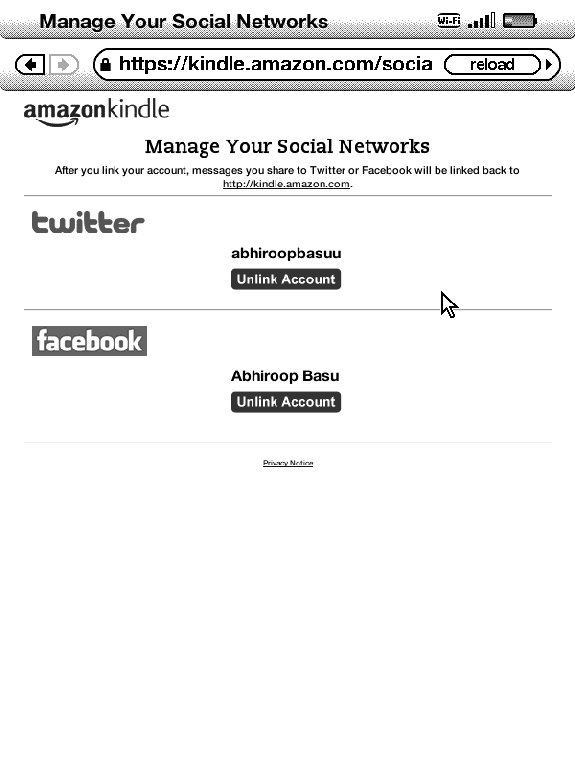 Firstly, you must connect your Facebook and Twitter accounts with the Kindle. Select Menu and Settings and use the Next Page button to scroll to the third page and select manage. This launches the web browser from where you must authenticate your Facebook and Twitter accounts. Once you have connected your accounts with the Kindle you can select text inside any book you are reading and post it to your Facebook and Twitter account. First, use the D-Pad to select the text you want to share. Next, select the Alt and Enter key to share the text. This will open a small text box allowing you to input a small message of your choice. You can now see the selected quote and your message displayed on your Facebook and Twitter profiles. Clicking the custom amzn.com link displays the selected text. This feature would be more useful if the title and author of the book was also displayed. 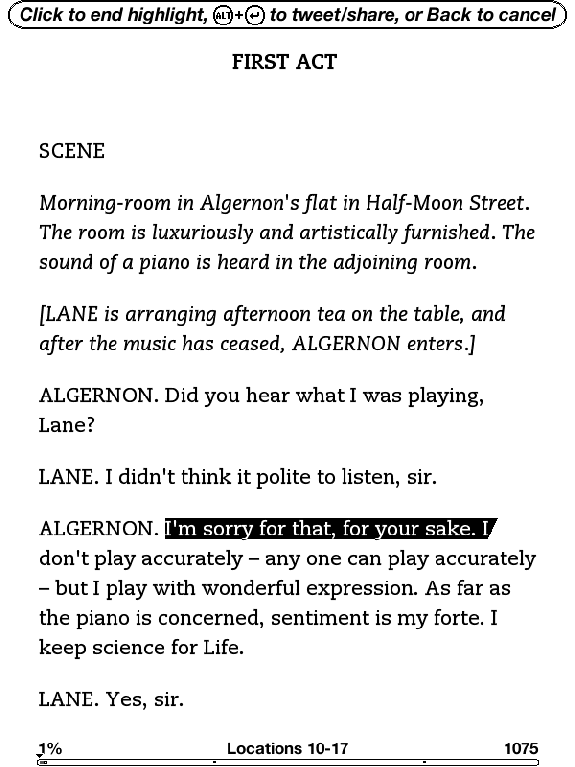 Nevertheless, this is a good way of sharing a passage that is particularly interesting or striking. 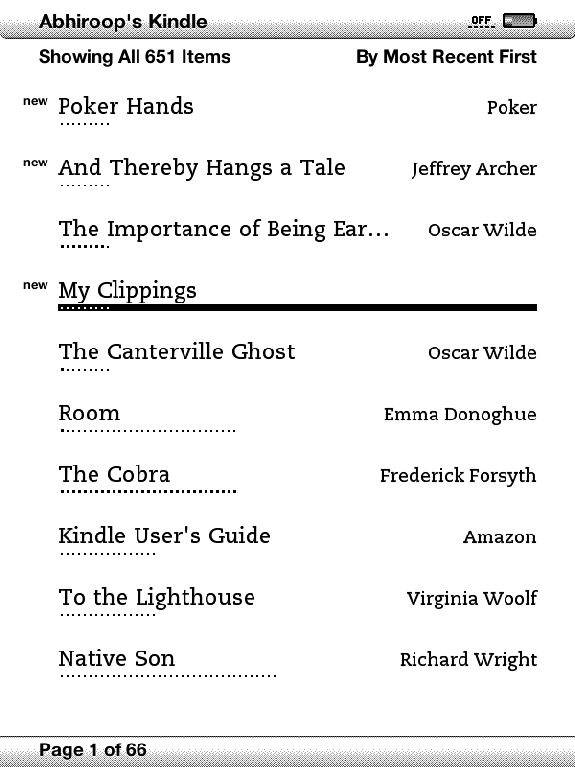 After selecting text, making notes within a book, or bookmarking a particular page you will find a My Clippings option on the home page of your Kindle. All your notes are displayed here but the separation between the sections is not always clear and it is a little difficult to navigate your various clippings. A friend mentioned to me that she did not want to give up reading books because she loved the ability to flip through the pages. Unfortunately, this is impossible to do on a Kindle and at times it can be a problem if you need to jump to a certain section of a book. If the book is very long it can be a pain to use the Next/Previous buttons to jump through the pages. 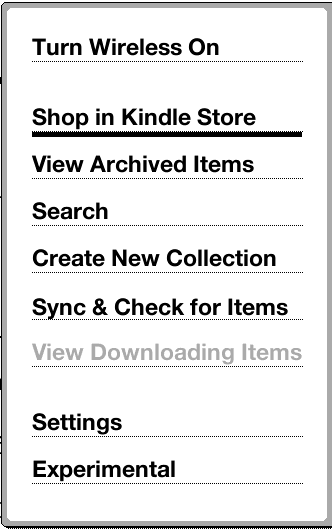 To alleviate this problem Amazon uses the “Location” feature to allow jumping to sections of a book. If you look at the bottom of a book you can see the location points displayed. In the message box you must enter the location number you want to jump to. 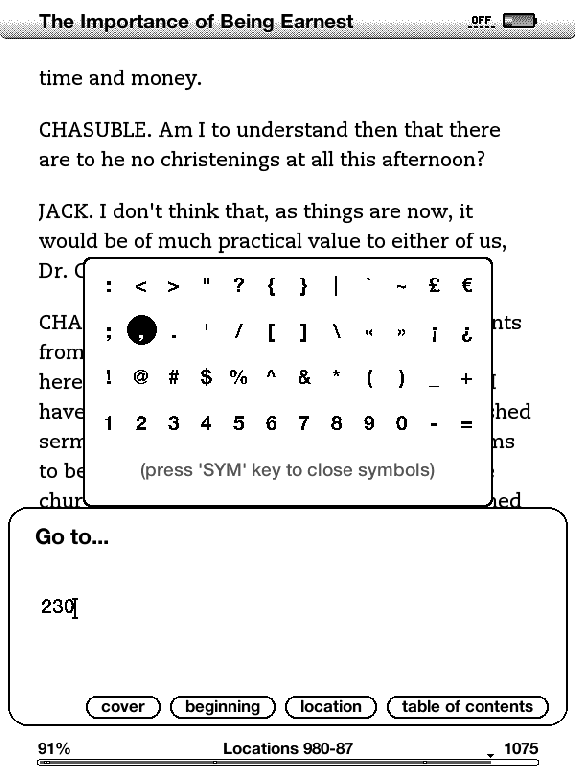 Unfortunately, the Kindle keyboard does not come with any number keys so you will have to select the Sym key and select the numbers from the pop-up box. This is the only method of jumping between sections of the book and unfortunately, it is not very specific. I will often have to flip through pages to find the part I was reading. 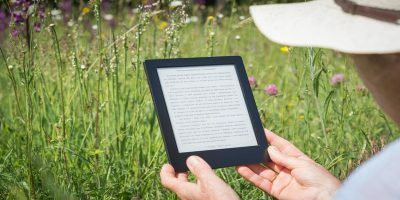 Amazon has refined the book reading features of the Kindle to the point where it is almost the perfect “E Ink” device, easily beating out its competitors. However, some of the features I have mentioned in this article attempt to keep it relevant in a world dominated by the iPad. There are still a number of features that the Kindle has to offer, so for all the Kindle users out there keep an eye out for another Kindle article. my Kindle has numbers on the key board — must be a newer one out already. This is helpful article though — I did learn a few things. thanks! yes, http://www.clippingsconverter…. is a true gem. I also use this site too. it’s pretty simple to use.I like to make notes/highlights of my favourite book for future reference. 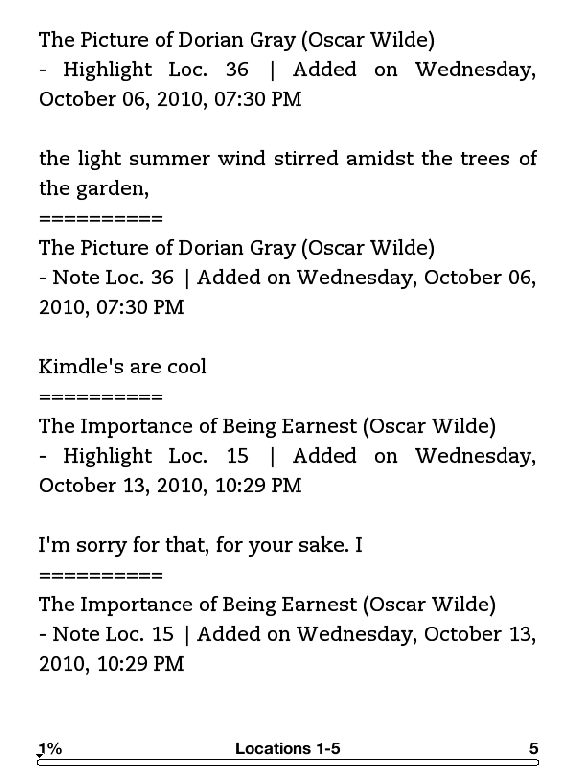 Those clippings get saved in“myclippings.txt” in the documents folder of your Kindle. Clippings converter exports these highlights/notes into Word, Excel or PDF files for better organization.You’ll first need to get the myclippings file from your Kindle’s documents folder after connecting the device to your computer. Once you get that, you can upload that to the site and download it in your preferred format. Turn your clippings into something useful – good luck! http://www.anysubjects.com is a great Kindle directory. It lists lots of easy to use Kindle – friendly websites all in one place. Every day more sites are being added, so it is worth returning to regularly.